Louis Malle found Glencoe, Minnesota, the subject of his seminal 1985 documentary “God’s Country”, by accident, driving through in search of material for a different film and falling into conversation with a local that piqued his interest. Frederick Wiseman, on the other hand, chose Monrovia, Indiana for his 2018 documentary of the same name on purpose. If his preceding films, “In Jackson Heights” and “At Berkeley”, were comprehensive studies of liberal enclaves, here he immerses himself in a red state small town in the immediate aftermath of you-know-who’s victory. You-know-who, however, is never mentioned. The closest the movie comes to deliberately stoking liberal ire is a close-up on a “Home to a Million Concealed Carry Permits.” But Wiseman tempers even that by gradually creating a synthesis of local commerce where the daily operations of a pizza parlor, a liquor store and a gun store are presented as homogenous and even anagolous to the small businesses of “In Jackson Heights.” Of course, the latter were being squeezed out by big boxes and gentrification, and the ultimate picture Wiseman paints of Monrovia is also bleak. In fact, “Monrovia, Indiana” seems to spiritually be picking up where “God’s Country” left off so many years ago, the slow death rattle still echoing across the Midwestern landscape. “God’s Country” was told through images, yes, but also through Malle’s own soul-searching narration and conversations with Glencoe residents, often between those residents and Malle himself, lingering just off camera, never seen but always present. That is not Wiseman’s style. He is not seen and never heard, and conversation, the look-into-your-own-heart kind, is generally absent from “Monrovia, Indiana.” When Wiseman does stop and listen, like with a few locals at the diner, he trains the camera on two of them as they try and remember who knows what, the exact subject matter immaterial, as eventually Wiseman cuts to their third companion on the other side of the table who looks as if he hasn’t been listening the whole time. Certainly conversations at the Hometown Café in my hometown always sounded about this enlightening, but there were other conversations behind closed doors digging deeper. I don’t meant to filter this all through my experience, but meaningful everyday dialogue is conspicuously absent. Images speaker louder than words, and all that, but in a doc that often holds an image for minutes at a time to just listen to words, you sometimes wish those words counted for more. Then again, what’s not said can be just as powerful. Near the beginning Wiseman visits Monrovia High School and plunks his camera down in a classroom for a considerable spell, just watching and listening as a teacher expounds at length on the town’s proud basketball history, including the legacy of Branch McCracken, concluding by explaining how the once hallowed midnight practice has been discontinued. The way Wiseman positions the camera, however, includes not just the teacher in the frame but a young female student too, in the left hand corner, sitting at her desk throughout this oration, listening, sort of, as her eyes frequently stare off into space, and as she repeatedly shifts in her seat, betraying restlessness. It might well be inherent behavior but it nonetheless comes across profound, one of the town’s youth indifferent to her town’s history. 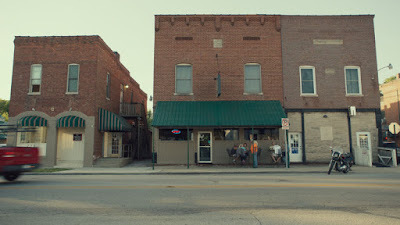 The sequences of youth in “Monrovia, Indiana” are conspicuously scant, mostly limited to the quick overview of the high school that the aforementioned sequence triggers, and we never hear from them directly. The most consistent conversation is heard in the documentary’s recurring city council meetings. This onscreen civic discourse sometimes includes ostensibly mundane subjects like fire hydrants which become the most important thing in the world to the person discussing them, particularly because in this case the hydrants in question don’t seem to work. These discharge pipes, we learn, are located in a development on the fringes of Monrovia called Homestead, one we never visit but frequently hear about it as becomes a symbol of progress, for good, for ill, for all in-between. Some see Homestead as necessary in relation to the need to entice new residents to keep the town alive while some think bringing in new residents gradually erodes the social foundation and will turn (is turning) the town into something it is not. Wiseman does not suggest who is right, even if he frequently casts “Monrovia, Indiana” in the light of an elegy. A town festival watches a bluegrass performance from the audience’s vantage point before Wiseman reverses the shot and we see the audience consists of a couple disinterested people sitting on small bales of hay. A ceremony at the Masonic Lodge honoring a Freemason for 50 years of membership is as lengthy as it is ritualistic as it is bungling and, given the median age in the room, emblematic of a way life that seems to be passing before our very eyes. To that point, one of the first scenes of the movie is a Bible Study in which New Testament scripture about life’s trials and tribulations are cited at length, all of which inevitably lead to the same end, a funeral, like those cows at the beginning with the tags on their ears. The person being buried is unknown, and seemingly to the Pastor too, whose eulogy comes across a little cut and paste, not that this drains the moment’s power. No, it adds power, reminding us that we need not know someone, or somewhere, intimately to be mindful of its circumstances. And the final shots of dirt being scooped onto the tomb in the town cemetery, while melancholic reminders of the end, perhaps in more ways than one, are also weirdly evocative of how life goes on; even burying the dead requires infrastructure.